One of the most underrated players we've had come through the Gamecock football program. Justice was always the man you could count on when we needed him the most. It's easy when we get caught up in big offensive plays to forget the development and what it took to spring that big gain or clutch touchdown. Justice was a tremendous blocking TE and would also catch everything you threw his way. Justice finished his career with stats that do not tell the full story of who Justice really is as a player, 50 rec, 581 yds & 1 TD. We feel like he will be an amazing TE in the NFL and will get his moment to show everything he's capable of. Justice will prevail. BCB: The big catch you had in the Vandy game last year was a huge momentum swing in the game and really set the tone for the rest of the season. Take us back to that play, what was the play call and what was was said on the field after the hit? JC: The play was Trey Tight Menu 9. I was not expecting to get the ball because I saw the corner on me, but when I saw it coming I knew I had to make the play. When I got up I was just saying, gotta bring it! BCB: A lot of NFL Draft Scouts are projecting you high and a “sleeper” TE pick. How do you feel it went at the combine and recent pro day and what are you hearing from teams? JC: I feel even though I did not run as fast as I wanted on either day, I felt like they saw I was athletic and ran better than what my numbers showed. A lot of teams are showing interest because of my versatility. BCB: You were a two sport athlete in High School. Where you ever close to playing basketball at the collegiate level? JC: Yeah, I had interest in Basketball from smaller D1 Colleges. I just wasn't the height that I would have liked to be. BCB: On Shaw’s TD run against Clemson, We remember seeing you block 4 Clemson defenders at once, tell us what you remember about that play. JC: I had just gotten a block in the back penalty earlier that game so I was more worried about not blocking my guy in the back. Once I felt Connor make his cut I saw that could also pick off the other defenders. BCB: Who is your favorite TE in the NFL right now and why? JC: My favorite tight end right now is Jason Witten. It used to be Jeremy Shockey though. BCB: How do you feel the TE's will be utilized during the 2013 season and do you see them being more involved with the passing game? JC: I think the tight ends will be used even more in the pass game but I don't think they'll be asked to do as much blocking wise. BCB: With more of a favorable schedule this season, how far do you see the Gamecocks going? Do you think they will return to Atlanta to play for the Conference Championship? JC: I think the sky is the limit for the team this upcoming season. BCB: What kind of music do you listen to before you take the field and do you have any pregame rituals? JC: I listen to a lot of music that will get my blood flowing a little and maybe a little angry. I'll never touch a football before pre-game warm ups. BCB: What is your favorite memory from playing at South Carolina? JC: My favorite memory is winning at Florida to win the SEC East. BCB: How emotional of a game was the Tennessee game for you? You had a huge day, we pulled off the win but Marcus went down again with his injury? JC: Tennessee was a very big game for me because I felt it was a chance to show my potential at the next level. I felt like I was playing for Marcus after he was hurt. 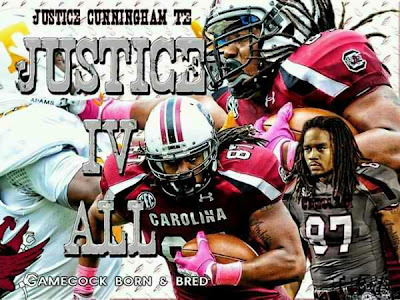 BCB: What do you want Gamecock fans to remember about Justice Cunningham? JC: I just want the fans to remember me as a player that you could always count on to get the job done whether it involved making a big catch or block.